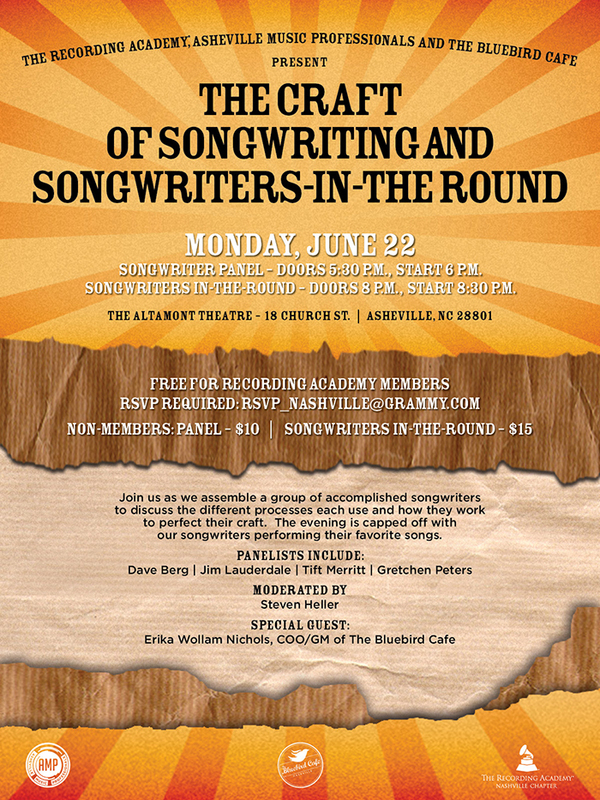 ASHEVILLE, NC — Asheville Music Professionals, The Recording Academy®, and The Bluebird Cafe Present The Craft of Songwriting Panel and Songwriters-In-The-Round on Monday, June 22, 2015 at The Altamont Theatre in downtown Asheville at 18 Church St. Doors are at 5:30 p.m. with the panel starting at 6 p.m., followed by a Songwriters-In-The-Round performance from the panelists. For the panel, a group of accomplished songwriters have been assembled to discuss the different processes each use and how they work to perfect their craft. Panelists include multiple GRAMMY and Americana Music Association Award-winning artist/musician, Jim Lauderdale, GRAMMY and Americana Music Association nominee Tift Merritt, and Nashville Songwriters Hall Of Fame inductee and GRAMMY & Golden Globe nominee Gretchen Peters, as well as ASCAP Country Songwriter of the Year, Dave Berg. The panel will be moderated by producer, composer, engineer, and three-time GRAMMY Award winner, Steven Heller. The evening is capped off with the songwriters performing their favorite songs as part of a Songwriter-In-The-Round performance. Special guest for the evening is Erika Wollam Nichols, COO/GM of The Bluebird Cafe. FREE FOR RECORDING ACADEMY MEMBERS. Jim Lauderdale is a multiple GRAMMY and Americana Music Association Award-winning musician and one of the most respected artists working the Americana, Bluegrass and Country music communities today. His record Buddy and Jim , which he wrote and recorded with longtime friend and collaborator Buddy Miller, was nominated this year for a GRAMMY in the Best Americana Album category and several Americana Music Awards, a show which he has hosted since 2002. Lauderdale has always stayed true to his North Carolina roots but is influenced from the experience of his travels. He first immersed himself in the early country music scenes of both New York City and Los Angeles before breaking through in Nashville as a songwriter. He has helped pave the way of the current Americana Movement recording records and writing songs that cross genres from country, pop, roots, rock, folk and bluegrass. Lauderdale, a master songwriter, has had his work recorded by artists such as Patty Loveless, Shelby Lynne, Solomon Burke, The Dixie Chicks and George Strait, who has had numerous hits with Jim’s songs. Lauderdale’s music has been featured regularly on the ABC hit show Nashville, and he has several tracks on the soundtrack of the successful film Pure Country. Lauderdale is often called upon as a player and has toured with the likes of Lucinda Williams, Mary Chapin Carpenter, Rhonda Vincent and Elvis Costello. He also co-hosts a weekly radio show on SiriusXM with Buddy Miller called “The Buddy & Jim Show,” which NPR’s Fresh Air described as “…highly entertaining…” Lauderdale is also the host of the popular Music City Roots each week from The Factory at Franklin, near Nashville, TN. He frequently collaborates with legends like Ralph Stanley, Elvis Costello and Robert Hunter and is also a critically acclaimed solo artist with dozens of studio releases, including his latest I’m A Song which is Lauderdale’s latest country endeavor, his 26th album to date. “I’ve always had a taste for traveling alone,” Tift Merritt sings in the title track of her fifth album. This time around, she got to prove it, “calling the shots myself and letting myself go wherever I needed to go” at a point in time when she was a free agent without label or manager. But the song does also conclude that “everybody here is traveling alone,” a realization that places as much value on community as iconoclasm. And Merritt put together her “dream cast” of fellow travelers to play on Traveling Alone, which found its happy home at her new label, Yep Roc. The road less taken doesn’t preclude good company. The New Yorker has called Merritt “the bearer of a proud tradition of distaff country soul that reaches back to artists like Dusty Springfield and Bobbie Gentry,” a standard upholding that got underway in earnest with Bramble Rose, the 2002 solo debut that put her on the Americana map forever. As her sophomore album, Tambourine, was followed by Another Country and See You on the Moon, Merritt found acclaim coming not just from critics and awards orgs but her own heroes, like Emmylou Harris, who marveled that Merritt “stood out like a diamond in a coal patch.” Now a leading lady in her own right, Merritt is hardly one to hog the spotlight. She engages in dialogue with fellow artists of all disciplines on her public radio broadcast and podcast “The Spark With Tift Merritt,” bringing in fellow sojourners ranging from Patty Griffin and Rosanne Cash to Rick Moody and Nick Hornby (who devoted a chapter to Merritt in his 31 Songs book). Merritt has released five studio albums to date and was nominated for a GRAMMY for “Country Album of the Year” for 2004’s Tambourine, which was also nominated for Americana Music Association awards “Album of the Year” in 2005. That same year she was also nominated for AMA’s “Artist of the Year.” Two songs have also been nominated as AMA’s “Song of the Year”: 2005’s “Good Hearted Man” and 2008’s “Broken.” Merritt was born in Houston but her family moved to Raleigh, North Carolina soon after where he grew up and attending the nearby university of Chapel Hill. Her latest album, Blackbirds, follows Peters’ 2012 album Hello Cruel World, which NPR called “the album of her career” and Uncut said “establishes her as the natural successor to Lucinda Williams.” If anything, though, Blackbirds truly establishes Peters as a one-of-a-kind singer and songwriter, one in possession of a fearless and endlessly creative voice. Producer, composer, and engineer, Steven Heller, has earned three GRAMMY Awards, five GRAMMY nominations, as well as a number of national awards for his music and recordings. His work encompasses music for artists, film, television, other media. Steven has secured options for feature film scripts as editor and producer. His produced and written story projects have garnered several GRAMMY nominations. Heller’s clients include MTV, 20th Century Fox, Miramax, Rhythm and Hues, National Public Radio (NPR), Public Radio International (PRI), and many others. He has served as music supervisor and producer for the Miramax film, “The Journey of August King,” and composed and produced music for the film. He has also composed, orchestrated, and adapted the music package for the Animal Planet Network, a division of Discovery Network, Inc., as well as scored numerous award-winning films, including features, documentaries, and children’s films garnering numerous Telly and Addy Awards for television and radio commercial music compositions. Heller has also been honored with Golden CASE Awards, three American Library Association Notable Recording Awards, several NAIRD (National Association of Independent Record Distributors) Awards, Parent’s Choice Gold Awards, National Association of Parents’ Publications Awards. Heller is based in Asheville, NC. President/COO of The Bluebird Cafe, Erika Wollom Nichols oversees all operations including marketing, sponsorship and brand development of The Bluebird Cafe name. She is also co-director of the Tin Pan South Songwriters festival. 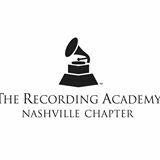 Past experience: Director of Development for NSAI, handling fundraising, marketing and community relations and VP of Marketing & Community Outreach at The Country Music Hall of Fame. She served on the Board of Leadership Music (2007-2010), and currently serves on the board of the ACLU of Tennessee and Folk Alliance International. 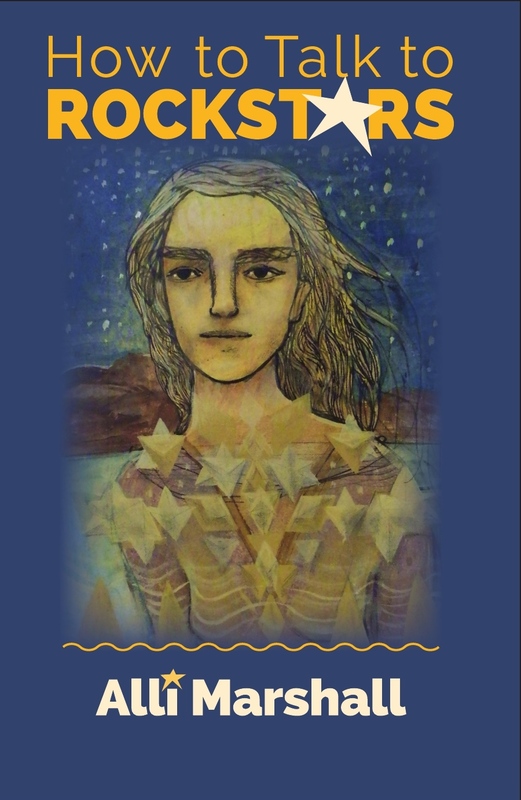 She received her BA in philosophy from Belmont University and her MFA from Vermont College of Fine Arts. 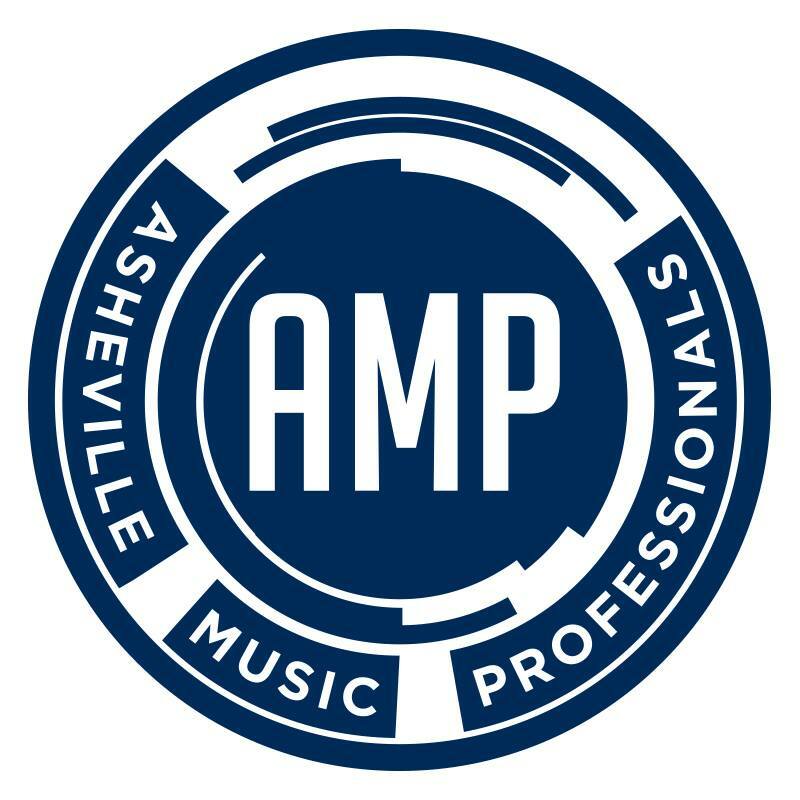 Asheville Music Professionals (AMP) aims to set the standard for good music business practices while acting as a common voice for the Asheville music industry. Together we can inform the community about the intrinsic worth and economic impact of music in our region. One of AMP’s main beliefs as an organization is that music is worth paying for. 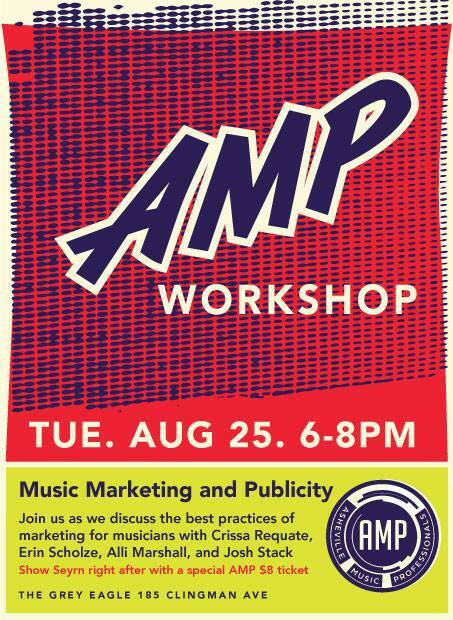 AMP also offers membership educational workshops, fun events and socials all targeted at advancing local music business. With a focus that extends from touring bands to recording studios, venues to festivals, and gear manufacturers to instrument repair shops, this hard working group of volunteers intends to make a positive impact on the lives of musicians and music lovers like you. The Mission is to provide education, advocacy, connection and collaboration for the people who work and thrive in music in Buncombe County. The Bluebird Cafe is one of the world’s preeminent listening rooms and the venue has gained worldwide recognition as a songwriter’s performance space where the “heroes behind the hits” perform their own songs; songs that have been recorded by chart-topping artists in all genres of music. Located in a small strip mall outside of downtown Nashville, the 90 seat venue is unassuming in appearance but some of the most significant songwriters and artists have performed on their stage. Their reputation as a listening room is based on the acoustic music that is their signature style. 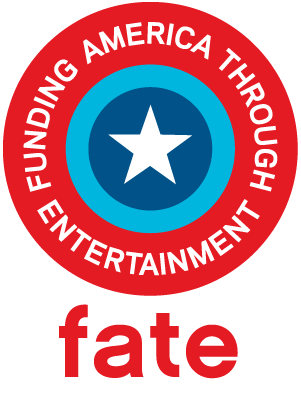 Their patrons repeatedly say that they are captivated by hearing songs performed by the creators themselves. In 2008, original owner and founder Amy Kurland sold the legendary venue to the Nashville Songwriters Association International, (NSAI) a 40+ year old, not-for-profit organization devoted to the service of songwriters and the craft of songwriting. More of a donation than a corporate sale, Kurland saw NSAI’s mission to “educate, elevate and celebrate songwriters” as a way to continue the Bluebird’s relationship to songwriters and to the community. In 2012 The Bluebird Cafe made its primetime debut on the ABC drama Nashville, where it plays a key factor in the show’s plotline which deals with both the music industry in Nashville, the political climate in Nashville and the key players in both these “worlds,” which often collide.